The Weight Watchers Program runs on a point system and was founded in 1963 by Jean Nidetch, a Brooklyn homemaker. This program has become so popular throughout the years and is now an international company that operates in over 30 different countries. The program includes regular meetings, learning sessions, group support, and uses its famous “point system” to help keep track of foods consumed daily. In all honesty, the point system is just a clever disguise for counting calories. You see foods and meals are all assigned a number of points which actually reflect the amount of calories. Everyone in the program has their own limit of how many points they are allowed to consume daily. Its core philosophy is to help members lose weight by staying within their caloric intake, learning healthier meal choices and providing group support. Weight Watchers may be a great program for some individuals, but it can be costly, especially for those on a budget or who may feel cheated to pay for a diet plan. 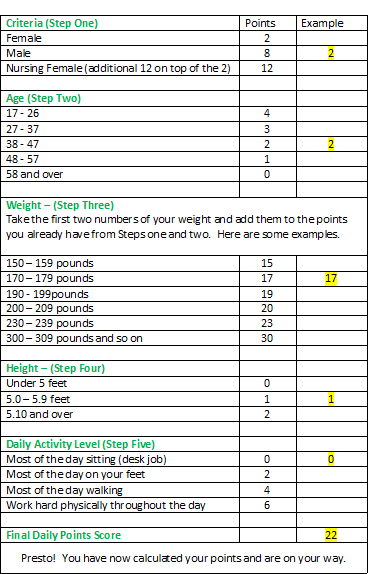 If you don’t like the idea of paying money for a weight loss program, use the following guidelines to figure out your daily points, for free. Go through the chart below and allot yourself the appropriate number of points in each category (or step). Then add them up and that is the points you are allowed to consume daily. For example, if I were a woman who is 40 years of age, who weighs 177 pounds and is 5.4 feet and has an office job, my score would be 22. There are many cookbooks available from Weight Watchers filled with recipes that have the points value assigned to them. This weight loss program is not a weird diet fad as you are actually eating healthy meals most of the time. There are no foods off limits as long as the dieter does not surpass his/her daily points allowed. Weight Watchers has a proven track record of helping dieters lose weight for over 40 years and has an amazing support group. On line help is also available now in these modern times. The program is not free. There is a joining cost of approximately $40 and a weekly cost of about $7 - $15 on top of that. You have to count points, which is really a clever disguise for counting calories because points reflect the number of calories. There may be times that the dieter chooses meals that are not very nutritious. This is because there are no foods that are off limits, so if a piece of chocolate cake has the same amount of points as a soup and sandwich combo, the decision is yours. This program is not a quick fix as weight loss is slow but steady. If the program is not followed weight loss is not achieved as with most diet plans. If you don’t mind the cost or counting points then this program can be a very beneficial diet plan. They offer regular meetings, learning sessions and group support, though as many diets go this plan is not for everyone.